Can you discover the periodic table? If I'm a realist*, then I think there is something real out there that I am labelling Betelgeuse. In good Kantian fashion, I can't know the reality - the 'Ding and sich' - but I can report on the sensory data from Betelgeuse and believe that I am talking about something that really exists. As it exists independent of humanity, we can discover it. However, Betelgeuse is also a class M star on the endearingly random looking stellar classification system that goes from O to B, A, F, G, K, and M. This system is not part of the reality that is Betelgeuse, it is a classification system that people devised - it's a representation of something - a different class of thing to a star. As such, the classification system cannot be discovered: it has to be invented or created by human beings. If I am a non-realist, who presumably doesn't thing there is a defined reality behind the label Betelgeuse, this has no effect on the constructed classification system, which is still invented or created. Let's now shift that picture to Mendelev and the periodic table. As a realist I can accept that there are relationships between different atoms based on their atomic weights and properties - that is something that can be discovered. But like the stellar classification system, I would suggest that a periodic table is a representation, a model, not an aspect of reality. As such, even as a realist, I would suggest it can only be created or devised, not discovered. 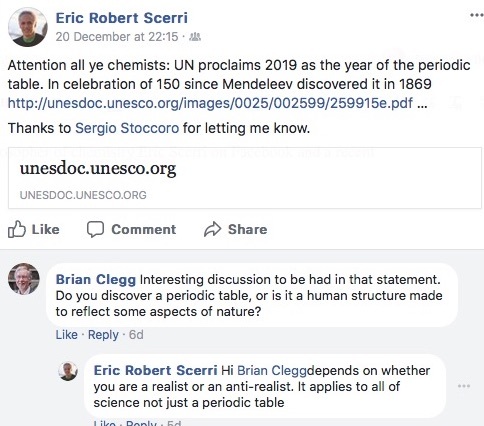 UPDATED - Eric has kindly replied - his response is below. I still respectfully disagree - not that there isn't some inherent structure reflecting atomic structure, but just that the concept of a two dimensional table on a piece of paper is just not a natural object - it's an artificial human model, based on the available data - and as such I don't believe it can be 'discovered'. I perhaps confused the issue by bringing in the stellar classification system, which I only intended as a simpler example to start with, but seems to have got in the way of the point! 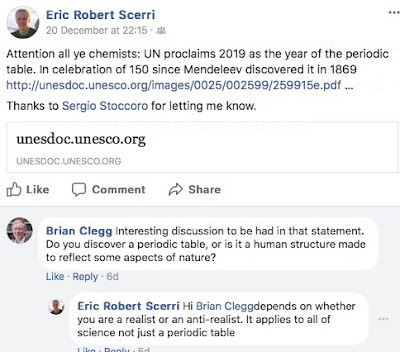 Eric Scerri: You raise a very interesting question. However I want to respectfully disagree with you since I think that the two cases you compare are not analogous in the way that you claim they might be. In the case of the periodic table there is no continuity between each of the elements. What I mean is that there are no intermediate elements with fractional atomic numbers. The elements are strictly discrete a feature was in a sense a foreshadowing of the discovery of the discreteness of quantum mechanics. Not surprisingly the periodic table is broadly speaking explained by quantum mechanics, which it helped in getting started in the first place (Bohr, Pauli etc.). In the case of the Russell-Hertzprung diagram one is dealing with a continuum of possibilities, an infinite number of intermediate cases. Returning to the periodic table, we now understand why an element falls into a particular group and shows similarities with several other elements. It’s because they share the same number of valence electrons. Of course electronic configuration does not cause chemical behavior in any strong sense of causation and it is more of a correlation between number of outer electrons and chemical behavior. The deeper ‘cause’ is understood by appealing to the Schrödinger equation for any particular atom which captures the dynamics of the atom in addition than the mere number of outer electrons. Correct me if I am wrong, but there are no counterparts to either such features in the case of the classification of stars. What I am really driving at is this. In the case of the periodic table one has a natural system of classification and perhaps the most natural system of classification one can think of in all of science. In the case of the R-H diagram we have an example of an artificial system of classification. There is nothing intrinsic in the stars that allows us to demarcate between one classification label and another. Stars could have been classified otherwise, and so it’s not a ‘natural system’. To take a more extreme example, the Dewey Decimal system of book classification is also artificial. It is we who decide how books in the various disciplines should be subdivided and ordered. In the case of the periodic table nature is being carved at the joints to use a favorite phrase among realists. The ordering principle of atomic number is given to us by nature. It is not imposed artificially. Arguments like these also get down into the heart of our languages and representation systems. I've studied iconicity in human language for more than 35 years, so-called 'sound symbolism', nonarbitrariness in the speech sign that is supposed to be very peripheral to real language according to linguistic dogma. Phonemes in human languages are supposed to be merely arbitrary distinctive signals allowing one to differentiate huge numbers of different word forms which are then themselves arbitrarily assigned to any referent without limit except in the case of relatively rare onomatopoeias. However the truth is a bit stranger than this simple story, which has been the received wisdom ever since the death of the early modern linguist Ferdinand de Saussure more than a century ago. I've found that in many (but certainly not most) cases languages contain huge numbers of relatively motivated forms, often under the rubric of what we call 'ideophones' (also termed expressives and a plethora of other terms). In these words, which in languages like Zulu, Japanese, Korean, Santali, and many others, come in the thousands, sometimes tens and potentially hundreds of thousands within the language as a whole (over all dialects), the phonological system acts like a periodic system of its own. Each phoneme covers a range of meanings based on its distinctive featural formula, as if it had a kind of quantum string designation. Commonly initial labials encode the idea of pressure loss (with associated material loss, energy loss, and more broadly motivational loss, etc. ), while word-finally the opposite tends to be encoded- gain or retention of same. Initial velars instead encode the mirror image set of ideas in initial and final positions. Even after decades there remains much still to learn about how these systems work. Interestingly they associate strongly with morphosyntactic type. Inventories are large only in languages which are at a certain stage of the morphosyntactic cycle- where aggutination is rampant but fusion of morphemes is minimal. At the opposite extreme (as in certain cases of polysynthesis as in Mohawk or Inuit) there are few or no ideophones. Even 'onomatopoeia' in such languages is referential to a nominal, 'sounds like a NP'. I hope such associations aren't part of the package of reality with periodicity, otherwise material reality as we know it may be transient. Evidence shows that the motivation of the iconicity present in phonosemantic mappings comes from the exaptation of the masticatory and deglutitional (chewing and swallowing to the unwashed) neurology and anatomy into communication along with all its own structures. The mammalian tooth set was differentiated to deal with foodstuffs of different material textures. Even your taste buds are organized on the tongue to deal with this. Sweet things in nature tend to be soft texturally, and dealt with in the front of the mouth, even without using the teeth. Unripe and bitter foodstuffs are dealt with in the back of the mouth, and are usually much harder, requiring much labor to reduce for swallowing. The sound system we use in language thus was originally partially motivated by our experience with the real world in manipulating it. 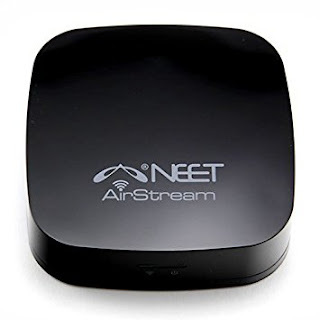 And these primitive notions also were extended to cover numerous different semantic domains in parallel, allowing for metaphor and other language play. So our own proclivity to array items according to property is ancient, allowing us to categorize the world. Expansion to other semantic domains allowed us to impose such order on things not exhibiting such organizational membership on their own. Though most languages have shifted away from overt iconicity in language, there is evidence that it hasn't been lost so much as hidden, encrypted to prevent transparency and thus easy informational access to unwelcome outsiders. Yet our need to create categories and classification systems remains intact.